This beautiful beach home has a gorgeous 'Golden View' of the ocean, a huge 240 ft wrap-around sundeck for sunning/tanning, and a 96 ft covered breezeway for out-of-the sun fun and relaxation. It will comfortably accommodate a family, but it's also perfect for 3 couples traveling together, or for just a romantic getaway. Divided into 2 stand-alone structures that are separated by a breezeway, the main quarters and guest quarters offer each guest the unique ability to choose between gathering in the main house for entertainment purposes or seeking privacy, rest and relaxation in the guest house. Decorated with quality furnishings and fixtures, this house has granite countertops, custom cherry wood cabinetry, and beautiful hardwood floors that span the open-concept kitchen and living room, half bath, and master bedroom of the main house and guest house. In the main house, enjoy your family and friends by gathering around the large 13X13 ft granite island and dining table, both seating 6. Sit in luxurious modern leather funiture and watch your favorite shows/sports on a large 42' SonyTV screen with DVD player. The master bedroom with king-size bed has hardwood floors and a private large bath with lovely large tile flooring, a double sink vanity and a spacious walk-in shower. Separated by the breezeway to ensure privacy, the guest quarters/area has 2 beautifully furnished bedrooms, each with queen-size beds. Both are joined together by a Jack and Jill bathroom with shower/tub. The washer and dryer is located in a separate room on the breeze way. At day's end, grab your favorite beverage, put your favorite music on, and relax on the reclining outdoor funiture as the breeze blows over you. Enjoy the amazing sunsets on the sundeck, 'catch a falling star', or just gaze upon the 'man in the moon' illuminating the ocean's shore! Act now to reserve this one-of-a-kind beach home for your next vacation getaway! You won't be disappointed! Keywords: Recently built beach home by Gulf of Mexico. Located on Bolivar Peninsula, close to Galveston. 2nd Row Cabin! Short walk to ocean. Unobstructed ocean view from right side of cabin, 240 wrap-around sundeck, 96 ft covered breezeway. Quality furnishings, custom cabinetry, granite countertops, tile and hardwood floors. Open-concept entertaining and private quarters. My wife and I were both born and raised in the Golden Triangle area. We bought our first beach home on this property years ago as a second vacation home. We made friends, enjoyed our family when they visited, and just loved being close to the sights, smells and sounds of the ocean. Unfortunately, Hurricane Ike took the house away from us- nothing was left except the property. Disheartened, many would not rebuild. But for us, we could not give up on the possibility of creating again what we had had before. And so this time we returned to build not only a home, but our dream vacation home. We find this home and all that it offers just amazing! We know that our guests will as well. We live in the Golden Triangle area 30-45 minutes from this home located in Crystal Beach on the Bolivar Peninsula - 15 minutes from the Galveston ferry. We have been coming to Crystal Beach all of our lives for family vacations. We chose this property because of its short distance to the Gulf of Mexico. It has front row access to and an unobtructed view of the beach. It is located 3 minutes from a large grocery store, gas, and church services. It is located on the second row from the beach with a beautiful view of the ocean. We built a 240 foot wrap around deck and 96 foot covered deck for entertainment. Our favorite ritual is to drink our favorite beverage and listen to music at day's end while gazing at 'man in the moon' illuminating the ocean's shore! Wonderful huge open sun deck with unobstructed view of ocean/beach! *ONLY upon request for additional fee with booking! Bring your on linens to fit 3 queens and 1 king . Pillows and blankets are provided for each bed. Breezeway with cypress bar and spacious covered deck, a sun deck with open view of ocean . This home is very comfortable and well equipped for great vacations! We stayed here over New Year's holiday and the view of the fireworks from the deck was wonderful and fun!. The location to the beach is great, and a 3 minute walk....kitchen is easy to use and has all the required equipment for quick meals. 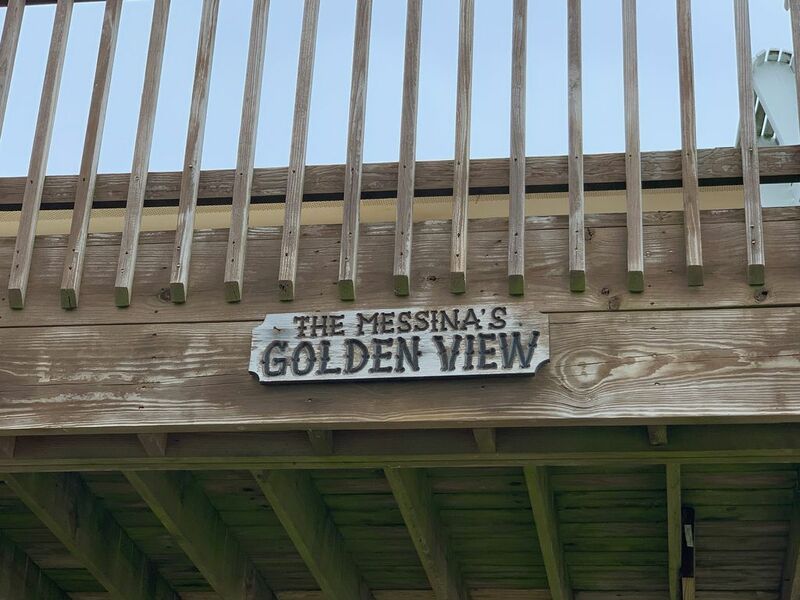 The bedrooms across the breezeway are awesome for putting children to bed and the adults can stay up and play games and have much fun either in the living area or on the deck. Our time was limited on the deck due to cold wet weather and we still had a blast! This property is great for multiple families as there are two separate sleeping areas. Conveniently locate to the beach, we could sit on the wraparound porch and watch our children and grandchildren having a great fun on the beach. The house is modern and nicely appointed. Everything we needed was available. This house was a great fit for our families. We had 7 kids age 4 to 16 and they all stayed very entertained. The house has everything you need for the stay. The deck is huge, has great chairs and has the perfect vantage point in that it always has a good breeze and you can see straight down to the beach. The 2nd and 3rd bedroom suite is separated from the main living area by a breezeway, which makes for a nice bit of privacy. The only mention is that one of the main living area doors opens very close to the stairs and if you have little ones, a baby gate is suggested --you'll need one that spans at least 48". We would definitely rent this place again and highly recommend it to others. We stayed here for our family vacation this year! This was one of the nicest beach homes we've stayed at. It was beautiful, fully stocked & had a great view of the gulf. The beach was right in our view, just feet away! The beach was awesome, clean & not overcrowded! We saw a sea turtle, caught a sea horse & collected buckets of shells! There was a store in town close by that had everything we needed, food, beer ect., but it was high priced. I have no complaints at all on our beach house or the property owner, but there were a few downfalls. The propane grill didn't work right, couldn't get all the burners lit, we had to cook our steaks & bbq in the oven. The other thing that was no fault of the owner, was that we had an ice chest full of beer & drinks that was stolen overnight in the downstairs covered garage. We called the sheriff & they said it happens all the time. You want to be sure & keep the downstairs well lit & don't leave anything out you don't want stolen. Also, the ferry in Galveston is horrible! It was a 2 hour wait & 20 minutes to cross. We left at 9am 1 morning to go to the grocery store in Galveston to buy our groceries for the week, and we didn't get back home until 3pm. It was a 6 hr trip! If we go back, we will def get all our groceries before getting on the ferry. I still give this place a 5 star rating because it was beautiful & we had so much fun! The owner Jake was very nice & attentive. I called him several times while we were there & he always answered promply. Love this place & will most definitely go back! This was my third opportunity to stay in this beautiful home. The location is perfect!!! The new furnishings are just beautiful. Can't wait to get back for another relaxing stay. very nice ,great side view but abig house directly in front.well furnished and comfortable.pocket doors on bathrooms makes it interesting at shower time.nights were great with many people shooting fireworks.shrimp boats fun to watch in morning,dophins gulls pelicans following them.i would rent again.great store 5 minutes away with clothes food ice gas .